Two members of Australia’s Climate Change Authority offer an alternative view on its latest report, arguing that the recommendations are not in line with Australia’s international climate obligations. As Members of the Climate Change Authority who have participated fully in the Special Review of Australia’s Climate Goals and Policies, we reached the conclusion, after much consideration, that we could not in good conscience lend our names to its report, published last week. Rather than resign from the Authority we decided to write a minority report. Here we present edited extracts from our report, which was released yesterday. The basis of our disagreement with the majority report is its failure to recognise the importance of the constraint put on all future emissions-reduction targets and policies by Australia’s carbon budget. The carbon budget is the total emissions that Australia can release between now and 2050 while still contributing its fair share in holding the global temperature rise to less than 2℃ – a key goal of the Paris climate agreement negotiated last December. The majority report should, but does not, address the relationship between its recommendations and Australia’s carbon budget, consistent with a fair and equitable national contribution to the global carbon budget. This is all the more regrettable because the requirement to do so is embedded in the Special Review’s terms of reference and was analysed in the First Report of the Special Review released in April 2015 (before the appointment of six new Members to the Authority in October 2015). In 2014 the Authority recommended an Australian emissions budget of 10.1 billion tonnes of greenhouse gases for the period 2013-2050. On this basis, it advised that Australia should set an emissions-reduction trajectory for 2030 in the range of 45-65 per cent below 2005 levels. Contrast that with the current 26-28 per cent target set by the Abbott government. Against the constraints of the carbon budget, the majority report accepts – explicitly in some places, implicitly in others – the government’s current target. But accepting this less ambitious target for 2030 is consistent neither with the Authority’s own advice to government, nor with Australia’s commitment under the Paris Agreement to play its role in holding warming below 2℃. The embedded pie chart shows the sliver of emissions that would remain to cover the 20-year period after 2030 if there is no change from the 26-28 per cent target. More than 90 per cent of Australia’s carbon budget to 2050 would be used up by 2030. 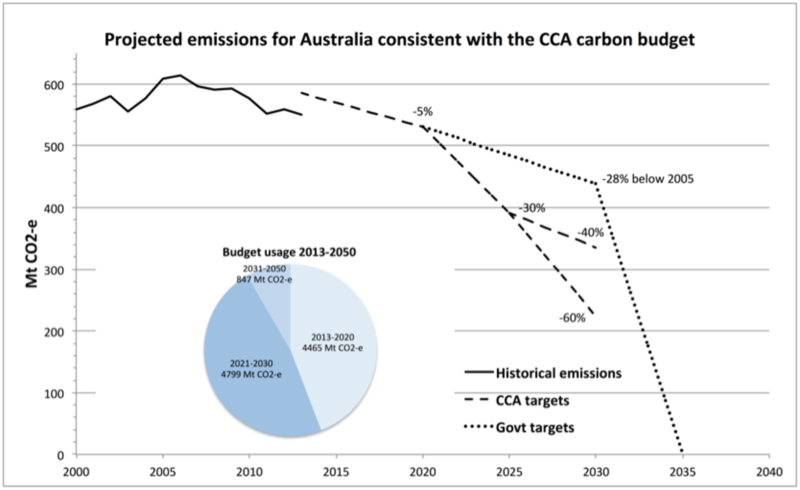 Australia’s emissions would have to decline precipitously and reach net zero by 2035. Keeping Australia’s current emissions targets in place would leave a huge amount of work to do after 2030. Image: Author provided. Such a dramatic reduction would be impossible to achieve. So the current target of 26-28 per cent lacks credibility because it is wholly inconsistent with Australia’s international obligations. If pursued it is likely to lead to a policy crisis within a decade or less. In our view, the failure of the majority report to make this clear to government and the public contravenes the Authority’s legislated obligation to deliver independent advice and to recommend measures that are “environmentally effective” and based on science. We believe that the effect of the majority report will be to sanction further delay and a slow pace of action, with serious consequences for the nation. Those consequences include either very severe and costly emissions cuts in the mid-to-late 2020s, or alternatively a repudiation of Australia’s international commitments, and free-riding on the efforts of the rest of the world. As we see it, the recommendations of the majority report are framed to suit a particular assessment of the prevailing political circumstances. We believe it is inappropriate and often counterproductive to attempt to second-guess political negotiations, especially for a new and uncertain parliament. The unduly narrow focus of the majority report, seemingly based on a reading from a political crystal ball, has ruled out policies, such as a strengthened renewables target and stronger land clearing restrictions, that have a proven capacity to respond most effectively to the nation’s climate change goals. The current target of 26-28 per cent lacks credibility because it is wholly inconsistent with Australia’s international obligations. If pursued it is likely to lead to a policy crisis within a decade or less. At the centre of the majority report’s recommendations is the retention of the current Direct Action policy as the basis for further action. Its two pillars are the Emissions Reduction Fund (ERF) and its incorporated Safeguard Mechanism, which sets an upper limit on emissions from major polluters. The report also recommends a new emissions trading scheme for electricity generation, based on an emissions-intensity baseline. Such a scheme would have lower price rises than the kind of cap-and-trade scheme favoured everywhere else in the world, and which Australia would have now if not for the Abbott government. After the rancour that engulfed the carbon price, the intensity-based scheme is presumably seen as more appealing to nervous politicians. The majority report downplays the drawbacks of emissions-intensity schemes and the Safeguard Mechanism. There is not space to discuss them here, but we would like to comment on the flaws in the ERF because the majority report recommends that it be hugely expanded. Under an expanded ERF policy, the cost to the federal budget would increase sharply, and even more so if Australia adopted tougher emissions targets in line with the science. Using the ERF in this way would be, in Professor Ross Garnaut’s words, “an immense drain on the budget”. We believe it is unwise to make Australia’s climate policy hostage to disputes over fiscal policy. As a rule, the replacement of the widely accepted “polluter pays” principle with the ERF’s “pay the polluter” principle is bad economics, bad ethics and bad policy. The practical drawbacks include the need for an expert bureaucracy to evaluate each prospective project and then to monitor, over several years, each successful project to ensure that the promised emissions reductions actually happen. There are also serious and continuing concerns about the issue of “additionality”. Under the ERF, it is hard to know whether the Commonwealth is wasting money by paying for emissions reductions that would have taken place anyway – that is, projects that are not additional. Bear in mind that businesses plan energy-saving projects all the time, so why wouldn’t they try to get a subsidy if one is on offer? Surveys show that a large majority of Australians want stronger action to reduce Australia’s emissions. The role of the Climate Change Authority is to advise on how that desire can be realised, in a way that is consistent with the best scientific and economic evidence. The full minority report can be read here. Clive Hamilton is professor of public ethics, Centre For Applied Philosophy & Public Ethics (CAPPE) and David Karoly is professor of atmospheric science, University of Melbourne. This article was originally published on The Conversation.